We were delighted to have been a part of St Colm’s High School’s recent Dragon’s Den competition. The competition gave year two pupils the opportunity to pitch their business ideas to a group of their peers before taking part in the finals which were sponsored by Workspace Enterprises. In preparation for the competition our Self Employment Coach Charlie talked to the pupils about entrepreneurship and what it takes to start your own business. Congratulations to Charlotte Heron who was the overall winner. Charlotte’s business idea was a fridge which had a screen on the front which recorded the use by dates of things as they are put into it and can be used to look up recipes and record shopping lists and things. 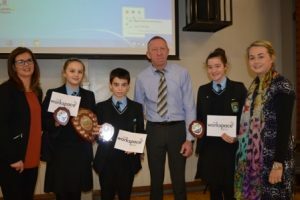 Photographed L-R with Charlotte are Christopher McCool and Orla Lagan who came second and third respectively along with their teachers Mrs Pauline McNamee and Ms Aislinn Carroll. Also in the picture is our Self Employment Coach Charlie.